Discover the latest developments in the field of medical 3D printing and understand how its applications will impact the industry. It comes as no surprise that 3D printing is revolutionizing manufacturing processes in various industrial areas, engaging more and more interest of researchers working in different scientific fields. Every year, the solutions which had seemed to be unreachable, become reality and although we are still decades away from having fully functional 3D printed human organs, the newest applications of additive manufacturing in the medical field are impressive. This article provides an overview of the current research and the latest developments on 3D printing applications in medicine. In May 2018, a team of researchers from UCLA announced the development of a new 3D printing technique that uses several materials to produce therapeutic biomaterials. 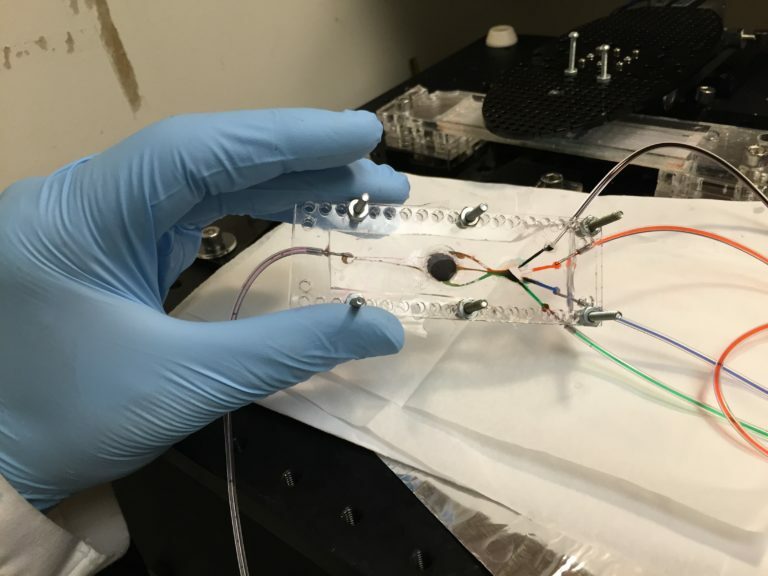 In order to create a bioprinter that is capable of producing complex artificial tissues, the team led by bioengineering professor Ali Khademhosseini modified a regular 3D printer. Based on the maskless stereolithography method, the machine is the first to use more than one material for automated bioprinting. According to the authors of the study, the printer is capable of building biostructures with as many materials as needed. In short, the printer uses the following process to build bio-tissues: special bio-inks solidify influenced by ultraviolet light guided with the set of micro-size mirrors, which ensure a high-printing resolution. The research team was able to print elements resembling muscle tissue and tumors with blood vessels, creating the biological models which could potentially be used for cancer studies. Moreover, those bioprinted structures have already been implanted into rodents in order to test their viability and were not rejected by hosts. This study shows that even if 3D printed kidneys or livers are at the moment beyond reach, additive manufacturing imposes the possibility to create microfluidics-enabled systems to test new therapies or drugs more effectively, before taking it to in-vivo stage of research. Also in May 2018, researchers from Newcastle University in the UK succeeded to print the world’s first artificial eye cornea. Developing a hydrogel consisting of alginate and collagen, they managed to create a material soft enough to be pushed out of nozzle of a 3D printer but still stiff and capable of holding its shape. The gel had been examined beforehand and proved to keep healthy donors’ stem cells alive for weeks at room temperature. Thereby obtained bioink gives an opportunity to print the artificial corneal tissue with no need for creating a scaffold first and growing the cells separately. The cornea is an outermost, multi-layer, transparent element of the human eye used to focus vision. Corneal dystrophies or blindness may result from inflammation, infection or degenerative diseases and only some of its effects can be corrected with laser surgeries. It takes less than 10 minutes to fully print an artificial human cornea with a low-cost simple fused deposition modeling 3D printer. Patient’s eye can be scanned in order to customize the size and shape of the tissue. Although the corneas developed in Newcastle will have to undergo further testing before being used for transplant, Prof. Che Connon is optimistic about his breakthrough. Another trend in medical 3D printing are “tattoos”, adhered or deposited directly on human skin. Engineers of Massachusetts Institute of Technology presented in December 2017 the ink made from genetically programmed living cells. The cells, mixed with nutrients and hydrogel, can form three-dimensional structures and have been printed on an elastomer layer to be easily stuck to the skin. The researchers, led by Prof. Xuanhe Zhao and Prof. Tim Lu used a custom 3D printer of a high resolution to print shapes containing only a few cells in each single printed line. The engineered bacteria cells are sensitive to different chemical and molecular compounds. 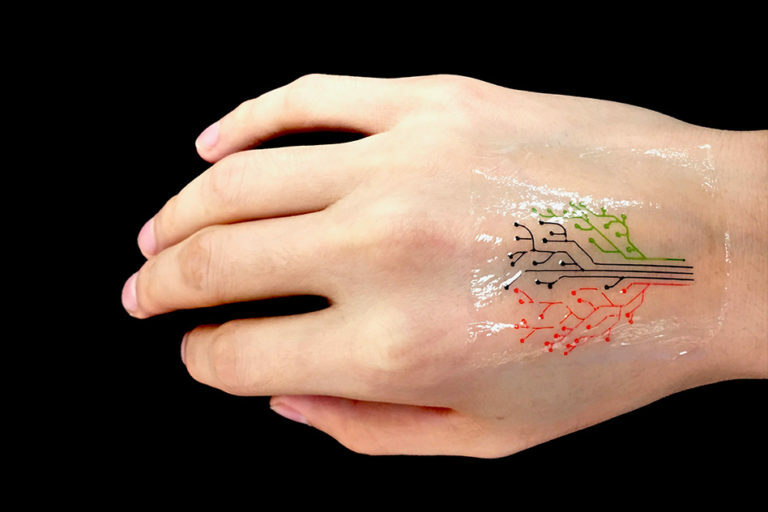 The devices, or rather transparent patches produced with this technique, may act as active materials and be used to produce wearable sensors detecting environmental chemicals, changes in pH or temperature. The bacterial cells light up in response to a range of chemical stimuli and can also communicate with each other, receiving signal from another cell. In the future, researchers expect to be able to print living, wearable computational platforms, comparable to microchips, which would pass signals between different cells back and forth. Such a solution in form of a tattoo could, for example, help the diabetics in monitoring their blood sugar level. Similar application of additive manufacturing was proposed recently at University of Minnesota, where researchers came up with a new portable 3D printer. The key innovation of this machine is that it can adjust even to the slightest movements of printing surface thanks to the real-time computer vision, which scans the markers temporarily placed on it. Hence, the material can be deposited directly on the human skin and other irregular areas. The printer was used to print electronics on a real hand for the first time and the fully functioning electrical circuit was produced. The ink made of silver flakes cures in low temperature and therefore does not burn the hand while being applied. It can be simply washed off or peeled off with tweezers. This printer might be useful in military, allowing the soldiers to quickly produce their own chemical or biological sensors or solar cells for charging the necessary equipment. The machine developed by Prof. Michael McAlpine’s team was also previously tested in printing biological cells on the skin wound of a mouse. However, mammalian cells are less likely to survive the printing process (to be precise – the pressure acting on them in a nozzle) since they rupture much easier and are more demanding in terms of nutrition than the bacterial cells used by MIT. The scientists at Imperial College London were provided with £1.7m of funding to conduct research on a new generation of 3D printed implants which could solve the main problem connected to currently available solutions – need for reoperation after a couple of years and invasive character of this procedure. The project is about to start in September this year. The 3D printed titanium and ceramic implants are not a novelty and have been used in dental and orthopedic surgeries for several years. Their main advantage is the personalized shape, adjusted to the case of specific patient. However, the currently existing solutions are suitable to treat the end-stage bone and joint diseases, not to prevent their progression. The cross-departmental team of medical doctors and engineers wants to manufacture early intervention implants, which could stay longer inside of a body and hence be offered to younger patients. Currently available endoprosthesis need to be replaced due to metal’s corrosion in physiological environment combined with harmful influence of dissolution products on the tissues surrounding it. The new unit will use advanced imaging techniques to work on materials in nanoscale to study its interaction with human body, strengthen the remaining natural bone and stimulate the growth of the soft tissues, such as tendons and ligaments. Researchers are also planning to enable monitoring health of surrounding tissues by using biomarkers and develop new nano-biomaterials to provide antibacterial coatings for the 3D printed implants. It seems that human organisms do not catch up with the increasing life expectancy over the last decades and the scientists from various fields must join forces to make up for it with technological advancement. Nevertheless, the latest developments in the field seem to be bridging this gap.